The Japanese video game industry is one of the largest and most innovative in the world. They are lauded for their creativity and longevity, as well as their broad cultural appeal. However, what many consumers don’t realize is that behind the graphics and fantastical plotlines often lies a broader significance. Many of the most popular franchises in Japanese video gaming are heavily based on mythology, both Eastern and Western alike. While it is often not apparent to many players, especially younger gamers or those who are not familiar with the mythological canon, these details give the gameplay and coinciding plots more depth, and can be seen as a reflection on the creators’ view of culture. Capcom’s 2006 release Okami is perhaps the most overt use of mythology in a Japanese video game. Much like the title suggests, the game makes direct reference to indigenous Shinto canon seen in classical works such as the Kojiki and Nihon Shoki, which detail the divine origins of Japan. The main character is a white wolf by the name of Amaterasu, who is seen as an anthropomorphic form of the sun goddess of the same name. While the game diverts from the canon of the Kojiki, the most important figures and details remain, for example, the slaying of the serpent Yamata no Orochi by the sea god Susanoo, brother of Amaterasu. Simply known as “Orochi” in the game, this creature serves as a primary antagonist. Before the events of the game take place, Orochi drove out the divine characters from the Celestial Plain, who used the Ark of Yamato to escape the destruction of their world. This alludes to the creation of the islands of Japan from the divine realm, whose new inhabitants were known as the Yamato people. Another major reference to mythology lies in the legend of Nagi, short for Izanagi. Nagi is depicted as a legendary warrior and ancestor of the character Susanoo who freed Nippon from the terror of Orochi a century before the events of Okami. Reference is also made to his true love Nami, likely a parallel to Izanami, who in tandem with Izanagi was thought to have created Japan, its inhabitants, and other deities. Amongst these deities (more often known as kami) are Amaterasu and Susanoo. Capcom’s reimagining of the Japanese mythological tradition does not serve as a religious fable of any kind, but rather a classic battle of good and evil. By styling the game as inherently Japanese and rooted within the nation’s rich cultural traditions. Players from other nations might be less inclined to recognize the many references, however, and many reviews indicate its popularity is solely based on the quality of gameplay and unique graphic stylization. Final Fantasy is oneof Japan’s most popular and successful video game franchises. Its 13 installments and variety of spinoffs are seen as the premier form of turn-based role playing game (RPG), as well as a pioneer of graphics and depth of story. The 1997 installment Final Fantasy VII (FFVII) is one of the best-selling games of all time, and to this day is considered a form of “required gaming” for the Japanese RPG enthusiast and gamer in general. However, what makes FFVII truly interesting is its use of mythological reference as well as an original mythology invented by the creators to flesh out an expansive universe. While the mythology within the game is more a source of inspiration than plot tool, the use of it is not insignificant. Examples of this are seen most clearly in the various god-like creatures the player can summon to assist them in battle, known simply as “summons”. The summon Shiva weilds the power of ice, and takes inspiration from the Hindu deity of the same name, although the former is always depicted as female, and the latter male. 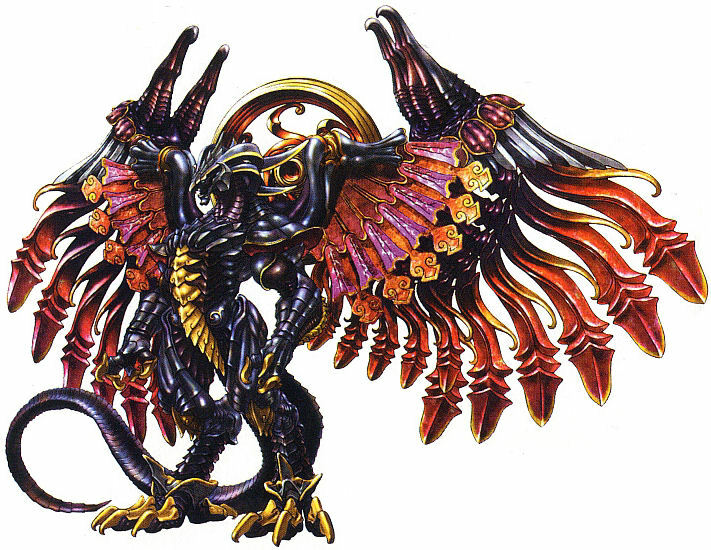 In addition, the summons Ifrit and Bahamut are based on creatures in Arabian mythology, noted for their strength and supernatural power. What is lacking in FFVII, however, is any real direct reference to classical Japanese mythology. The closest example would be the main antagonist Sephiroth, who weilds an extra-long katana known as the Masamune. The weapon’s name is a reference to the swordsmith of Japanese legend by the same name. Much like Masamune was thought to be the greatest executor of his craft, Sephiroth is thought to be the ultimate soldier. However, this is where the Eastern inspiration in the game seems to end. Sephiroth takes his name from one of the ten attributes that the Judeo-Christian God manifests through, and his moniker “the One-Winged Angel” gives off a decidedly Western vibe. In a sense Sephiroth can be seen as a “hybrid” character – he displays elements of both Japanese and Western mythological origin, and is all the more powerful for it. Other elements of a Western mythological canon include idea of a hero on a journey, namely, the physical and emotional journey the protagonist Cloud undergoes throughout the game. Cloud is something of a tragic figure. Although handsome and well-liked, he spends most of the game running from his violent past and the immense guilt he faces. In a sense his experiences parallel those of Hercules, a brave and exceptional warrior who committed horrific crimes, but eventually found redemption through his heroic deeds. In addition to the various allusions to known mythology, FFVII has a mythological canon of its own. The story takes place on a planet known as Gaia (an allusion to the Mother Earth-like figure from Greek lore) or simply just “the Planet.” At its core is a mysterious ocean of energy known as the Lifestream. Its nature is cyclical; the Lifestream gives living things life, and at death their souls return to it, allowing for the planet to retain energy. In a sense the Lifestream is similar to the River Styx, which according to Greek myth houses the souls of the dead, and is a mode of transit into the afterlife. The Planet was once inhabited by a race known as “Ancients”, who were wiped out when a mysterious alien known as Jenova crashed on Gaia and infected the population. The events of the game are set in motion by the harvesting of Lifestream energy, known as Mako (魔晄 “magic light”), began taking a toll on the Planet. In addition, Mako was used in conjunction with leftover DNA material from Jenova to create super-soldiers, namely Cloud and Sephiroth. The result is a cautionary environmental tale in conjunction with a battle of the hero (Cloud and his allies) against the forces of evil (Sephiroth, Jenova, Shinra Company). In theory, the only thing that differentiates it from traditional mythology is its futuristic nature. And finally, another prime example of the mythology of video games can be found once again within the Final Fantasy franchise. Final Fantasy X (FFX), released in 2001, borrows heavily from both Eastern and Western traditions, and contains its own canon as well. FFX is set in a world called Spira, where magic, religion, and technology are in a constant struggle for balance of power. Several characters are personifications of traditional mythological figures, most notably the hero Tidus. Tidus, unlike the brooding Cloud, is upbeat and full of bravado, which both helps and hurts him. He is countered by the female protagonist Yuna, whose occupation as a Summoner combines the practices of a magician and a priestess. It is often thought that these two characters embody the notion of Yin and Yang, opposites who fit each other perfectly due to their differences. The two are also seen as Christ-like figures, as they both are willing to sacrifice themselves for duty and their personal beliefs. An overarching theme within the game is that of a religious fable, as well. Tidus arrives in Spira due to an attack by a massive monster known only as Sin, who manifested as a consequence of human wrongdoing, namely the overuse of technology. This is a common motif in many myths, whose etiological nature seeks to provide humans with an explanation for the way things are. Many of the themes within this game and others are universal, which is quite possibly a reason for their success and cross-cultural appeal. Although the topics and allusions within Japanese video games may not be apparent to all players, their presence signifies a deeper meaning than most take this media for, and could possibly be the creators’ push for more cultural legitimacy. 1. Why do you think video game creators choose to base their work on mythology? 2. When it comes to Japanese myth, are video games a good representation of the culture? Or are they Mukokuseki? 3. Does a “deeper meaning” in video games provide more appeal to players? Kieran G. Blasingim. “HERO MYTHS IN JAPANESE ROLE-PLAYING GAMES.” Thesis. Bowling Green Sate University, 2006. Print. I liked this article, specifically the sections on the hybridization of myth. As far as the Japanese half of the mythology becoming mukokuseki, I don’t think that’s really too much of a worry. While the total significance of each reference is not (usually) completely comprehended by a foreign audience, it is distinctly Japanese. The big swords, the big hair — there are certain visual queues that alert foreigners to something Japanese. If anything the Japanese half of the myth furthers foreign interest in Japan. The Western world knows its mythology. It’s been done and done again. While I can understand the game producers’ thought train of hybridizing myth to give Westerners an entry point, an interesting strategy, with great potential is to tell more Japanese myths in entirety, like “Okami.” I haven’t played the game much myself, but I know “Okami” to be one of the most critically acclaimed games for the Playstation 2. I’ve played Okami and I knew about its mythological basis, but I never really thought about myth in other Japanese video games, so this was a fun article to read. I think that part of what makes Japanese RPGs like Final Fantasy mukokuseki is it’s use of Western myth and archetypes. A lot of the themes are familiar to a Western audience, so it takes no understanding of Japanese culture to fully immerse in the game. Whereas a game like Okami, which uses specifically Japanese myth is definitely not mukokuseki and I think distances the Western player from it a bit. The player is more conscious of it being a Japanese game so I think it’s a different experience from a game like Final Fantasy where you just get caught up in the created world. Any Japanese aspects just become part of the created world and don’t really remind the player, “btw this is a foreign game.” Everything is so fantastical that Japanese aspects (e.g. name of Sephiroth’s sword) don’t stick out. Final Fantasy and other RPGs like it definitely tie into the escapist aspect of GNC.